The grass looks greener on the other side of the fence, especially if its an artificial surface, as I found out when visiting Technical Surfaces with Jon Beal of Netflare to provide web marketing training. This gave me a glimpse into the world of artificial surfaces. With an estimated cost of £300 000 to get a new pitch constructed and surfaced, why should a club or council countenance having an artificial site instead of a natural turf one, especially when the maintenance costs of an artificial surface are slightly more expensive to maintain, at £8000pa (instead of £7500pa for turf). Answer, a ten fold increase in available playing time per week, The average turf play time per week is 4h, in contrast, artificial surfaces permit 40h per week. Artificial surfaces come in a variety of depths, depending on the sport they are to be used for – very short pile for Tennis and longer pile for football pitches. The surfaces are also seeded with an inert medium such as sand or granulated rubber. Evenly spread this gound supports the blades and provides a hard wearing surface. To get the most of the artificial surface over its 10 – 15 year life and keep the manufacturer's warranty, it does need regular maintenance. Sweeping is a frequent need, to even out the spread of the sand or rubber ground and straighten the blades again. Many clubs are unaware that more frequent sweeping and maintenance can have a beneficial effect. 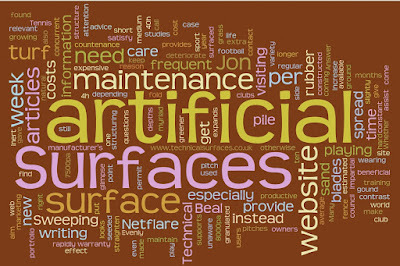 For this reason, Technical Surfaces have made it their aim to provide impartial information on artificial surface maintenance on their new (and still growing) website. Jon and I were there to assist them with both website structure and advice on writing relevant articles that can satisfy the myriad of questions by users and owners of artificial surfaces. Whether its artificial playing surfaces or your website, they need constant care and attention, otherwise they deteriorate rapidly, with concurrent extra costs to put right! To find out more about artificial surfaces and their care – make a point of visiting www.technicalsurfaces.co.uk over the coming months as their portfolio of articles and case studies expands. For more information on structuring your website and writing productive articles, give me a call or contact Jon Beal at Netflare. This weblog provides valuable information to us I enjoy reading your posts.